In 1860, as Barcelona burst outside its medieval walls and expanded into the Eixample, it did so with feelings of ambivalence mixed in with ambition. Now that the city finally had room to build, how should it go about it? Tired neoclassical forms and pastiches could hardly express the spirit of the cultural reawakening of the Renaixença. Catalan architects found their greatest inspiration in a book called Der Stil (1861–3) by German architect Gottfried Semper. Semper described how architecture derived from the shelter, warmth and defence of the cave and evolved according to need and society; a building and its decoration, he declared, should express its function. To mimic historical styles, as the medieval revivalists were doing, was repulsive. It was essential to be modern, and Modernisme, as the city’s new style came to be known, employed the latest technologies while never forgetting Semper’s influential dictum that ‘Originality is a return to origins’. Barcelona’s Modernista architects would respond to all these often contradictory currents in surprisingly different ways. What they did have in common, however, was their fervent nationalism (both Lluis Domènech i Montaner and Josep Puig i Cadafalch were also politicians). It was a trait they shared with Barcelona’s newly assertive bourgeoisie, who had piles of money to spend and the empty streets of the Eixample to fill up. Although part of the Arts and Crafts movement of the later 19th century, Modernista architecture had little of the drooping, tendrilly melancholy of the slightly later Art Nouveau or Jugendstil. There's no aesthetic fin de siècle tristesse; it is vigorous, bold, colourful and often playful. The Modernistas and their clients were optimists who felt that Barcelona, once proud capital of the kingdom of Aragon, at long last was on her way again. The first great Modernista, Lluís Domènech i Montaner (1849–1923) wrote what would become the manifesto of the movement and designed the style's first masterworks. Josep Puig i Cadafalch (1857–1956) took key Romanesque and Gothic principles and adapted them to modern construction in several of Barcelona's most iconic buildings. Some who collaborated with Gaudí built some astonishing buildings in their own right, especially Josep Maria Jujol i Gibert, master of colour tiles and ironwork and Joan Rubió i Bellvé, the king of bricks. Gaudí’s closest collaborator, his ‘right hand’ Francesc Berenguer (1866–1914), was also from Reus. He left a charming legacy, mostly in Gràcia. 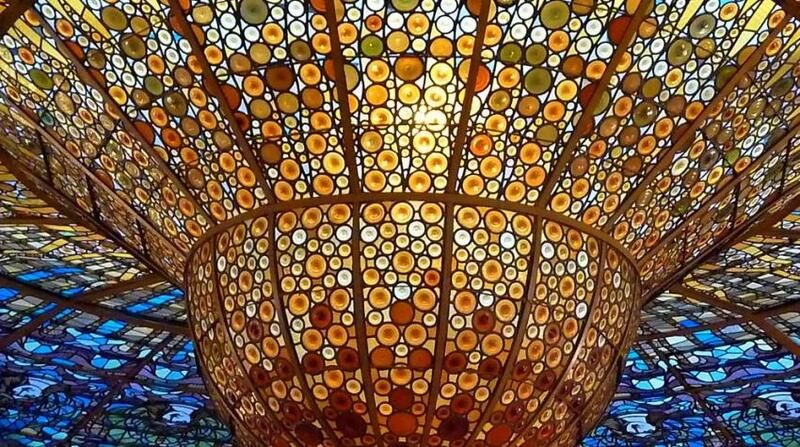 Some suspect his contribution to Gaudí’s work was as important as it was un-publicized. While Modernista architects concentrated on revitalizing Catalan building with references to history, nature and myth, Modernista painters were keen to modernize Catalan society itself and open it up to the artistic trends emanating from Paris. Their work may have never quite risen to the level of Barcelona's star architects, but 1897, four of them, inspired by stays in Montmartre, returned to Barcelona and founded Els Quatre Gats as their hang-out and showcase, where they nurtured a young Andalucian named Picasso. 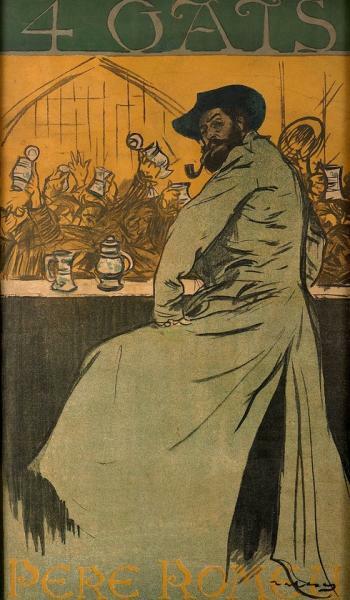 The most talented Barcelonan was Ramón Casas (1866–1932), the ‘Catalan Toulouse-Lautrec’. His great friend, the high-spirited Santiago Rusinyol (1861–1931), was an amiable morphine addict now better known for his amusing writings than his pretty landscapes and genre scenes; his legendary Modernista festivals at Sitges flirted with Symbolism in art and literature. One of the more original figures was Isidre Nonell (1873–1911), who painted poor gypsy women in simplified forms, the would inspire Picasso’s Blue Period. The Modern collection in MNAC has a representative selection of Modernista painting, while Picasso gets his own museum, which houses many works from his Barcelona days. Rodin was the strongest influence on Modernista sculptors. The expressive Miquel Blay (1866–1936) worked on the Palau de la Música Catalana, along with the delightful and prolific Eusebi Arnau, who supplied many of the nymphs and dragons that prance over Modernista buildings, such as the Casa Lleó Morera The most Rodin-like was Josep Llimona (1864–1934), author of the popular. His masterpiece is the greatest of all Modernista public works, the startling Monument to Dr Robert.